Holy Ramadan, observed by more than one billion Muslims around the world, is celebrated in Azerbaijan on June 15 this year. With the Islamic lunar calendar, being approximately 11 days shorter than the Gregorian calendar, Ramadan migrates throughout the seasons. The start and end of the month may vary from country to country and is based on a combination of physical sightings of the moon and astronomical calculations. The holiday, which is believed to be the month Koran was first revealed to Prophet Muhammad, is a time for spiritual purification achieved through fasting, self-sacrifice and prayers. The Fast of Ramadan lasts the entire month, which is a time of worship and contemplation for Muslims. As all the Islamic world, Azerbaijani people has also been fasting this month. President of Azerbaijan Ilham Aliyev congratulated the Azerbaijani people on the occasion of Eid al-Fitr. “I sincerely congratulate you and all our fellow countrymen living in different parts of the world on the occasion of holy Eid al-Fitr and extend my heartfelt wishes to each of you,” said the President. “It is remarkable that this year’s Ramadan days coincide with the celebrations of the centenary of the Azerbaijan Democratic Republic, the first secular democratic state in the Muslim East. The patriotism and unshakable determination of Azerbaijani sons and daughters to strengthen our independence as a state is a vivid example of attachment to historic traditions and national values,” said Ilham Aliyev. Mental peace is experienced during Ramadan, something that takes a man away from this world for some moments, when he feels God's presence with him. The meaning of fasting is that it cleanses the soul by commutating it from worldly activities. The country’s Muslims do not eat, drink, smoke or engage in sexual activities. Exceptions are traveling, pregnancy, illness, menstruation and breastfeeding. They even work on Ramadan. “Dear God, I fasted for You and I believe in You and I put my trust in You and I break my fast with Your sustenance. Today I tried to be a good Muslim. If I live tomorrow I shall continue to be a better Muslim,” this is one of the prayers that comes from the depth of a Muslim’s heart. After the sunset prayer, Muslims gather in their homes or mosques to break their fast with a meal called iftar that is often shared with friends and extended family. The iftar usually begins with dates, as was the custom of Muhammad, or apricots and water or sweetened milk. Laylat al-Qadr, major blessings of Ramadan, is believed to have occurred on an odd-numbered night during the last ten days of Ramadan. The Islamic world believes that especially on this day God forgives all sins and grants all prayers, and that is the reason why Muslims say this night is better than a thousand months. Fasting is completed with holiday of 'Eid al-Fitr.' On this day, it is required that all wealthy Muslims aid the less fortunate. 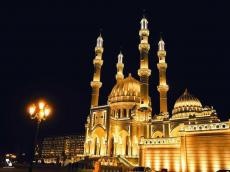 Azerbaijan, a predominantly Muslim country, has celebrated the Ramadan officially since 1993, following the collapse of the Soviet Union. Azerbaijani Muslims did not stop fasting even during the Soviet period when all religious holidays were banned. Azerbaijan has always been one of the historical and cultural centers of the Islamic world, and for centuries the Azerbaijani people have been committed to their religious, national and moral values. The freedom of conscience and freedom of religion are fully ensured in accordance with local legislation and international law.